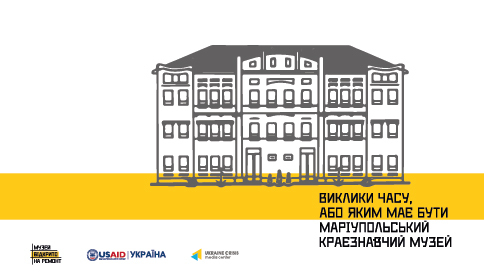 A round table within the project “Challenges of time or what should the Mariupol local history museum be like?” will be held at the Mariupol local history museum (Heorhiyivska str. 20) on February 20 at 12:00. The event takes place in the framework of the project “Under construction: Museum open III” run by Ukraine Crisis Media Center with the support of the United States Agency for International Development (USAID). In2020themuseumwillmarkits100thanniversary.It is its first centennial. The museum developed in Soviet times – in another state under a different ideology. Today inertia makes Ukraine’s local history museums continue the working course formed several decades ago. Even though it is already worked out and has no future. How to move on? Today there’s a choice of several directions – to become a museum or an entertainment place, a purely academic institution or choose the most difficult path of being a “museotainment” center prioritizing local history and showcasing all aspects of life in the area. Under such a scenario the museum is also supposed to become the center for all-round development equally of interest to children, youngsters and adults. An up-to-date museum is a comfortable environment where the need for inclusion is taken into account. What is the vision of the locals of the Mariupol local history museum? An opinion poll held within the project will bring the feedback of Mariupol’s residents to the museum staff. The round table will see representatives of the Mariupol community, local self-governance and Ukraine’s leading museum professionals discussing the museum’s further steps. It is expected that the all-round discussion will result in new ideas, recommendations, comments and add-ons to the museum’s development concept and new work approaches as well as help draft a road map for the museum’s development, define its place within the society and in the overall urban structure. The Mariupol local history museum is the oldest one in Donetsk region. It was founded on February 6, 1920 in a former shelter for World War I veterans. Its first name was the Mariupol’s main regional (povit-level) museum. The museum collection numbers 58.000 exhibits. Among the collection’s highlights there is an archeological collection and items of the Mariupol Neolithic tombs, a collection of medieval statues, the charter granted by Catherine II and Alexander I to Greek Christians who left the Crimean Khanate, archive documents of the Mariupol-based Greek court, a collection of dried plants, geological specimen, taxidermy fish, mammals and birds etc. “The museum’s centennial history” exhibition will be also presented during the round table. It reflects the long and complex way that the Mariupol local history museum has made. The project “Challenges of time or what should the Mariupol local history museum be like?” is curated by Maria Zadorozhna, head of the Ukrainian Institute. Working group at the Mariupol local history museum: Natalia Kapustnikova, director; Raisa Bozhko, deputy director for research work; Oleksandr Hore, department head; Oksana Pavlyuk, head of advertising; Nadiya Hashenenko, head of history department. Round table speakers: Natalia Kapustnikova, museum director; Raisa Bozhko, deputy director for research work. Invited speakers: Oleksandr Kochurin, deputy mayor; Diana Tryma, director of the department for cultural and civic development at the Mariupol city council; Halyna Sheichenko, head of Mariupol’s construction directorate; Maria Slyota, head of the tourism and promotion department at the Mariupol city council; civil society representatives of Mariupol. Press contact: Oleksandr Hore, museum department head: +38 096 370 01 62 and Olha Honchar, PR consultant at the “Under construction: Museum open” project: +38 093 339 76 46.